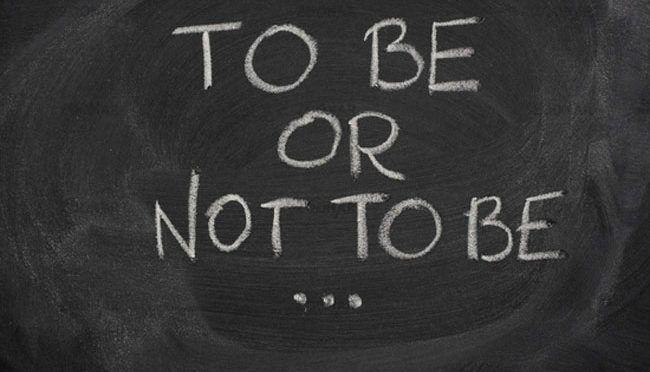 Chapter 5: To Be Or Not To Be | Who Am I? God wanted man and woman to be part of eternity with Him, the scope of which we can only guess at. Adam and Eve set the pace for all generations of mankind. We have all failed to do the right thing in life situations in our own strength. But God through Jesus has given us a second chance to participate in this age of God’s grace and blessing toward those born of a woman. “ And you he has quickened, who were dead in trespasses and sins; wherein in times past you walked according to the course of this world, according to the prince of the power of the air, the spirit that now works in the children of disobedience; among whom we had our conversation in times past in the lusts of our flesh, fulfilling the desires of the flesh and of the mind; and were by nature children of wrath, even as others. But God, who is rich in mercy, for his great love wherein he loved us, even when we were dead in sins has made us alive together with Christ, (by grace are you saved;) and has raised us together in heavenly places with Jesus Christ: that in the ages to come he might demonstrate the exceeding richness of his grace in his kindness toward us through Christ Jesus,” Ephesians 2:1-7. In meditation and reflection of the knowledge God has provided by his Holy Spirit through the Bible I feel humbled. God has chosen us within the framework of his Word to be part of His eternal plan. We are a major factor in God’s cleansing of sin and the works of evil in this earth. As willing regenerated children of God, we prove that God’s love works and it is the strongest force in the universe. God’s love did not lose sight of the great potential mankind was created for, to be part of God’s eternal destiny. To be part of God’s eternity or lost in a world of oblivion and destruction is, in reality, a personal choice. The physical world around you is not all there is in this walk we call life. There is a physical world we all know about, the sun and the moon and the earth and the air and the water and all things perceived with our mind through the five senses of the body. And we know that the physical world is governed by natural laws. Laws of physics and mathematics tell us what we can or cannot do in the natural world. An airplane that weighs thousands of pounds is able to fly by applying these laws. We can go from the bottom floor of a building to the top floor trusting in these laws that operate an elevator. We as people have come to rely on these laws with our very lives. If we put faith in the natural world because of natural knowledge as we grow to adulthood, then perhaps as we grow to spiritual adulthood we can put faith in spiritual law through spiritual knowledge. If you have realized in your heart and mind what God’s love has done for you through Jesus and accept Him as Lord then what is the next step in your walk with God? “ Therefore I urge you, brothers, in view of God’s mercy, to offer your bodies as living sacrifices, holy and pleasing to God-which is your spiritual worship. Do not conform any longer to the pattern of this world, but be transformed by the renewing of your mind. Then you will be able to test and approve what God’s will is-his good, pleasing and perfect will.” Romans 12:1-2. If we are now God ’s children then we should seek his will but it is hard when we live in the same body with the same physical desires and lusts. Our minds are still subject to the same thought patterns that we developed out of a life of mistrust, abuse, guilt, regret, fear, doubt, pain, and undesirable habits that may not please God. The twelfth chapter of Romans in the Bible can help us find God’s will in our lives. The first two chapters of Romans 12 outline an overcoming, successful Christian life in God’s eyes. First, we must offer our body as a living sacrifice in worship to God. The human perspective of life as physical only must change. We are spiritually alive now and must develop our spiritual awareness to understand a spiritual God and his will for us. The spirit cannot guide us if our body and physical desires control us. The power of sin lies in the physical world. Remember what happened to Adam and Eve in the Garden of Eden and their want for something new and different in the Tree of Knowledge. The flesh must not control us seeking for pleasure or satisfaction. Jesus said in Matthew chapter six that if God takes care of the birds of the air and creation itself then how much more will he care for those he calls sons and daughters. But seek first the kingdom of God and His righteousness and all these things (cares and needs of life) will be given to you. This is Jesus promise and it reveals the proper attitude concerning the world around us. Either God is in control or he is not. God is worthy of our trust by His Word alone because he is God. Our bodies must be dedicated as the temple of His Holy Spirit, which is our heritage given physically and spiritual by Jesus. At the same time we must not conform any longer to the pattern of this world, but be transformed by the renewing of the mind. The mind is the key to becoming an overcoming Christian. If we are not to conform any longer to the worldly patterns of life then with God’s help through the Holy Spirit we must change the conditioned thought patterns of our mind and replace them with the eternal thought patterns from the mind of God. This is accomplished through the renewing of the mind. Joshua after the death of Moses was at the Jordan River and was told by God to go into the promise land and possess it. As God’s new leader of the nation, Israel God told him how to have success and overcome the great adversity in the land. “ Be strong and courageous. Be careful to obey all the law my servant Moses gave you; do not turn from it to the right or the left that you may be successful wherever you go. Do not let the Book of the Law depart from your mouth; meditate on it day and night, so that you may be careful to do everything written in it. Then you will be prosperous and successful…for the Lord your God will be with you wherever you go,” Joshua 1:7-9. Joshua was told to be courageous and fear not and be successful by meditating on God’s Word and Law. Thus he would renew his mind to God’s eternal way of thinking. The building of faith is made stronger through understanding and obedience of God’s Word. “The Word of God is living and active. Sharper than any double-edged sword, it penetrates even to dividing soul and spirit, joints and marrow; it judges the thoughts and attitudes of the heart,” Hebrews 4:12. The Old Testament of the Bible tells us that God’s Word never returns void but accomplishes that purpose for which it was sent. God’s Word will change your life and build your faith and give you success in life. “ 17 So then faith comes by hearing, and hearing by the word of God,” Romans 10:17 (NKJV). When the Word of God is received in the heart of man or woman all things are possible. As we incorporate God’s precepts and spiritual laws in into our daily living and become doers of the Word as James 1:22 tells us, then we will renew our mind to the eternal thinking of God. As our understanding is increased we are able to demonstrate in our life what is God’s good, acceptable, and perfect will. As we discipline our self to the knowledge of life through the word of God, then God becomes more real in our lives and it becomes easier to accept an eternity with the God of the universe and we begin to understand what the Old Testament people meant when they said “the joy of the Lord is our strength.” The closer we get to eternity the less we operate in fear and doubt and uncertainty. Our confidence is in the work that Jesus did,” 1 There is therefore now no condemnation to those who are in Christ Jesus, who do not walk according to the flesh, but according to the Spirit.2 For the law of the Spirit of life in Christ Jesus has made me free from the law of sin and death, Romans 8:1-2 (NKJV). My worth as a person is made complete in Jesus. My acceptance of the Father God is built on His desire to fellowship with us. I am changed as I obey God’s word and teaching. “8 Finally, brethren, whatever things are true, whatever things are noble, whatever things are just, whatever things are pure, whatever things are lovely, whatever things are of good report, if there is any virtue and if there is anything praiseworthy–meditate on these things,” Philippians 4:8 (NKJV). Do we have control of our thoughts? The mind responds to information we feed it. If we read a book, watch television, listen to the radio, read a paper, see a movie, go to school, attend church, go to work, all these things and other stimuli in the world influence our thoughts. But the knowledge of God is where life is found. Good and evil works both begin as a thought in our mind. If we are consumed with the thought of possessing money then we might be tempted to steal if the opportunity develops. But if I am thinking of God’s Word that says, “ The Lord is my Shepard I shall not want” then I will know that God will provide somehow if I trust Him. I realize there is no need to steal. “ 13 Let no one say when he is tempted, “I am tempted by God”; for God cannot be tempted by evil, nor does He Himself tempt anyone.14 But each one is tempted when he is drawn away by his own desires and enticed.15 Then, when desire has conceived, it gives birth to sin; and sin, when it is full-grown, brings forth death,” James 1:13-15 (NKJV). The mind is the battlefield. Satan the god of this world would have us fill our minds and thoughts with self-serving pleasures and sinful lust, telling us there is no one to answer to, eternity begins and ends with us. But Jesus tells us that he is preparing a place for us in eternity that where he is we might be also. Satan’s message is one of despair and hopelessness. God ’s message is one of edification and eternal hope. “3 For though we walk in the flesh, we do not war according to the flesh.4 For the weapons of our warfare are not carnal but mighty in God for pulling down strongholds,5 casting down arguments and every high thing that exalts itself against the knowledge of God, bringing every thought into captivity to the obedience of Christ, 2 Corinthians 10:3-5 (NKJV). The Word of God is the sword of the Spirit and the major weapon in the war for the mind and soul of man and woman. As new children of God we must continue taking baby steps and drinking the sincere milk of the word of God till we can consume meat growing in the knowledge of God and His eternal values. In humility submit yourself to God and begin your walk to eternity learning responsibility as a child of God. Experience the peace and joy that comes from the Father of lights as we walk in the light of the Word. God has many things in store for you. Don’t grow weary be encouraged by the Word of the living God. Line upon line, precept upon precept, trust in what the Holy Spirit teaches in the Word of God for out of the mouth of God flow the issues of life.